Saturday Night Live continues to flounder under the Trump presidency, consistently struggling to say anything of substance about an era of American politics that’s nothing if not absurd. Celebrity cameos stand in for jokes, with the likes of Ben Stiller, Matt Damon, and Robert De Niro returning time and again to take roles away from the main cast members and deliver mediocre impressions. 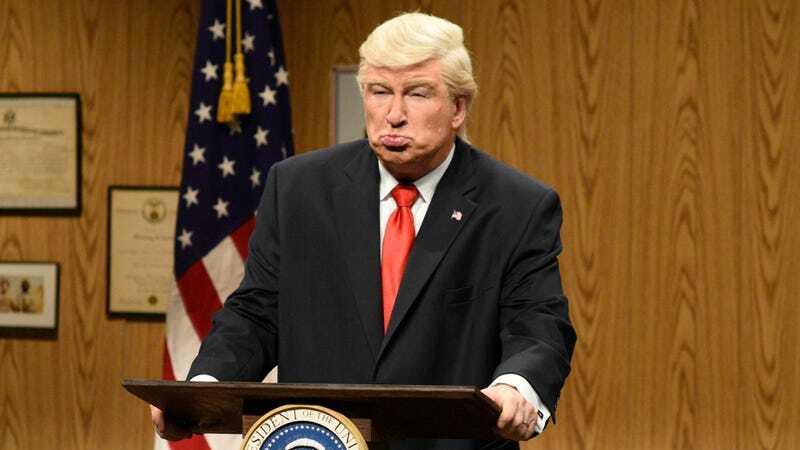 None, though, are worse than Alec Baldwin’s mugging turn as our president, which is basically “Drumpf” made manifest. Ask Baldwin, though, and he’ll tell you Trump doesn’t deserve a good impression. That’s what he told IndieWire, anyway. The good news is that his reign of terror might be coming to an end, potentially opening the door for one of the show’s current cast members or, if they’re devoted to the guest route, the great Darrell Hammond, who previously played Trump on SNL. It usually isn’t, unfortunately, so the least we could get is a good impressionist in the role. Just Nicolas Cage bringing that Bad Lieutenant energy to "Purple Rain"